FFA - Please urge U.S. Attorney General Jeff Sessions to determine if CAIR should be designated as a terrorist organization. Please urge U.S. Attorney General Jeff Sessions to determine if CAIR should be designated as a terrorist organization. This issue is so important that Florida Family Association is providing several means for you to communicate with U.S. Attorney General Jeff Sessions. Florida Family Association sent a letter on January 27, 2017 to President Donald Trump which respectfully requested that he conduct an investigation based upon certain facts and other intelligence to determine if the Council on American Islamic Relations (CAIR) should be designated as a terrorist organization. Thousands of people followed up by sending emails, letters, tweets and Facebook posts to encourage the president to take action. Florida Family Association sent a letter on March 4, 2017 to United States Attorney General Jeff Sessions which respectfully requested that he conduct an investigation based upon certain facts and other intelligence to determine if the Council on American Islamic Relations should be designated as a terrorist organization. Jeff Sessions is one of President Trump’s closest advisors and most important cabinet members. And as head of the Department of Justice, the Attorney General would oversee an investigation of CAIR. Why is this effort so important? CAIR is the largest Islamist organization in America, and they are intimidating Corporate America and government agencies in order to adopt Sharia doctrine in their public policies. CAIR is demanding that companies accept Salah times of Islamic prayer, Hijab head covers for police officers and employees, Halal certified food for prisoners, etc. CAIR is the engineer behind the Islamophobe false narrative propaganda machine which is dumbing down Americans’ understanding of the real threat of Sharia law and impairing their willingness to report suspicious behavior. There have been no arrests or indictments of CAIR officials regarding terrorism since 2010 when President Barrack Obama ordered the FBI to stop surveilling mosques and Muslims. Prior to 2010, eight top CAIR officials had been sentenced to prison, deported or fled America because of their involvement with terrorism. This issue is so important that Florida Family Association is providing several methods for you to communicate with the United States Attorney General. • EMAIL: Click here to send your email to U.S. Attorney General Jeff Sessions. • DEPARTMENT OF JUSTICE CONTACT FORM: Click here https://www.justice.gov/doj/webform/your-message-department-justice to send a message to U.S. Attorney General Jeff Sessions. There are only four blanks to fill out: Name, Email Address, Select Topic and Your Message. Please Select Topic "Messages to the Attorney General." Suggested message: I respectfully request that you conduct an investigation to determine if the Council on American Islamic Relations (CAIR) should be designated as a terrorist organization. The United Arab Emirates’ ministerial cabinet listed the Council on American-Islamic Relations as one of 83 banned terrorist organizations on November 15, 2014. Many Council on American Islamic Relations officials have been sentenced to prison and/or deported for supporting terrorism. 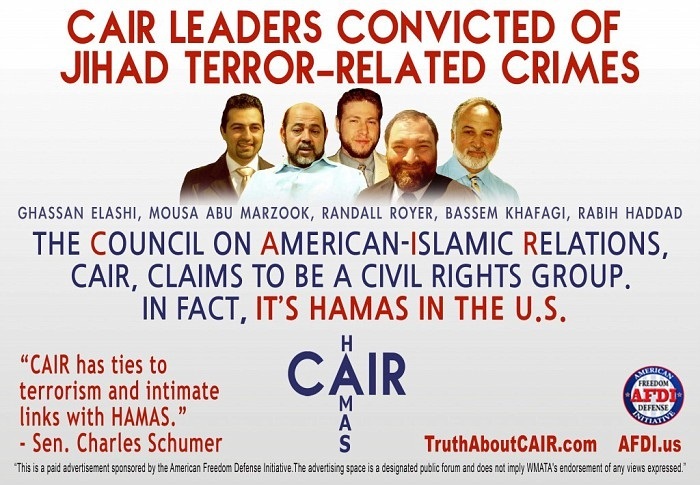 These CAIR officials include: Ghassan Elashi - founder of CAIR’s Texas chapter, Mousa Abu Marzook, Randall Royer - CAIR’s former civil rights coordinator, Bassem Khafagi - CAIR’s former community relations director, Rabih Haddad - a former CAIR fundraiser, Siraj Wahhaj - CAIR’s advisory board member, Muthanna Al-Hanooti - former head of CAIR's Michigan branch and Nabil Sadoun - a former CAIR board member. Numerous CAIR officials have defended terrorists. In 2007, the United States Department of Justice named CAIR as “unindicted co-conspirators” in a criminal conspiracy to financially support Hamas in United States vs Holy Land Foundation. In 2014, then Attorney General Eric Holder refused to turn over to Congress the Department of Justice’s documents regarding the Council on American Islamic Relations in the United States vs Holy Land Foundation terrorist prosecution. Attorney General Eric Holder gave the documents to the Council on American Islamic Relations. Many CAIR leaders proclaim support for Hamas and Islamic imperialism over the United States. CAIR is working hard to make Sharia law legal in the United States. Sharia law is antithetical to the rights afforded all Americans under the United States Constitution. • USPS MAIL: Click here to print a letter and mail to U.S. Attorney General Jeff Sessions. Place the letter in an envelope or print the two sided letter with the address on one side, fold and mail. • FACEBOOK: Facebook your request to U.S. Attorney General Jeff Sessions at http://www.facebook.com/DOJ Suggested message: Please investigate to determine if CAIR should be designated as a terrorist organization. • TWITTER: Tweet your request to U.S. Attorney General Jeff Sessions at https://twitter.com/TheJusticeDept Use the "Tweet to Justice Department" button in the top left column. Suggested Tweet: Please investigate to determine if CAIR should be designated as a terrorist organization.